The big news in Colorado ski country is that the Snowmass Ski Area is finally – finally – getting some respect. Nine miles down the road from glittery Aspen, Snowmass has always struck me as the proverbial middle child. Aspen Mountain, a.k.a. “Ajax,” has legions of fans who love its quirky terrain and the fact that it deposits you at day’s end at the doors of The Little Nell, the ne plus ultra of ski hotels and a serious après ski spot. Locals and would-be locals head for their private powder stashes on Aspen Highlands or Buttermilk mountains. But Snowmass? This behemoth of a mountains draws loyal families as well as locals who will tell anyone who will listen that the skiing is wonderful and often amazing. Those words have fallen mostly on deaf ears. Naysayers have always pointed to the lackluster hodgepodge of a base village, where improvements have stopped and started for decades, and shrug their shoulders. Until now. The new Snowmass Base Village (SBV) is a $600 million family-oriented, mountain-resort development, the largest one currently under construction in North America. It’s a 10-year project that will add lodging, residences and amenities to the world-class mountain and resort. Completion of the current phase of construction is set for November 2018, just in time for ski season, and includes the Limelight Hotel, ski-in/ski-out residences, a public events plaza with ice skating rink, new restaurants and bars and a community center. The new Base Village and Limelight Hotel will celebrate with a grand opening on Saturday, Dec. 15, 2018. At long last, Snowmass will finally have a heart – and ideally, some soul. SBV is a collaboration of three Colorado-based companies: East West Partners, Aspen Skiing Company and KSL Capital. They’re working to maintain the vision of Aspen architect and artist Fritz Benedict, who conceived a plan for a pedestrian village at the base of the resort way back in 1967. Work commenced in 2004 but was then suspended at the onset of the recession in 2008. The current projects build on that first phase of development. One of the coolest aspects of the project is the new 99 room Limelight Hotel, which will feature an indoor/outdoor lounge area, a five-story indoor climbing wall open to the public, a fitness center, kids game room and spa pools. There will also be 11 free-market Limelight Residences (only five remain for sale) ranging from $1,925,000 to $4,765,000. The development will also serve as the site for the Snowmass Mountain Club, an exclusive private club, offering member parking, lockers and lounge area for convenient ski access. Lumin is SBV’s most exclusive address, with three private-access residences featuring contemporary mountain design. One is sold. A four bedroom is available for $4,400,000 while the 3,284 sq. ft. four bedroom penthouse is $6,300,000. 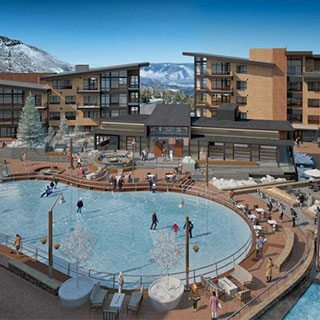 Fall 2019 will see the completion of One Snowmass, two residential buildings with 41 condominium residences connected by a glass walkway. Both whole ownership and fractional ownership properties are available. The inspiration for the two-building project draws from mid-century modern ski lodges, the minimalist style of Aspen’s Bayer Institute and the mining architecture of the Roaring Fork Valley. Owner amenities will feature a rooftop lounge with infinity spa pool, fire pit and lounge areas and a fitness center. One Snowmass will also house the SBV arrival center with check-in and concierge services, a restaurant and retail space, a yoga studio, as well as the mountain’s medical clinic. Units range from 1,630 square foot two bedroom residences to a 3,836 square foot penthouse. Finally, The Viceroy Snowmass Residence, part of the existing Viceroy Snowmass hotel, is now offering ski-in/ski-out, whole ownership residences ranging from studios to a three-bedroom penthouses. They start at $472,500 for a one-bedroom unit. Snowmass not only has a true luxury trajectory but will soon offer a sleek, modern village that is ready to compete with the best.